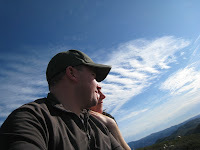 On Monday Ashley and I were able to go hiking to Sitton Peak which is a great hike in the Cleveland National Forest. We hiked to the top of Sitton Peak, which is one of our favorite hikes. Ashley and I highly recommend this hike to any Southern California or Orange County Hiker, since it offers such amazing views and is deep in the San Mateo Canyon Wilderness. For more pictures of our hikes to Sitton Peak make sure to check out our Facebook Page. Directions to Trailhead: To hike to the top of Sitton Peak Via the Bear Canyon Loop: Park across the street from the Ortega Oaks Candy Store off of Ortega Hwy (Coming from Orange County take the Ortega Highway going East). The trailhead is located right behind the candy store, indicated with a sign for the Bear Canyon Trailhead. You want to take the bear canyon loop to the 4 corners area (about 3.5 miles in where the Verdugo Trail, the Tenja Trail, Bear Ridge Trail and Bear Canyon Trail meet). At that point there is a marker for the trail to Sitton Peak. Once you hit the 4 corners area, you have a little over a mile and a half to go, it is mostly uphill from there. The last climb up sitton peak is a fun one, a nice little scramble of less than a quarter mile. A map of the area can be found below in the Google map. You will need a Forest Adventure Pass to park at the trailhead. One can be purchased at the Ortega Oaks Candy Store across Ortega Highway. Description of Hike: The total Distance for our hike to Sitton Peak was 10.3 miles with an elevation gain of approximately 2,200 ft. The hike was a little longer than usual since we completed the full Bear Canyon Loop. 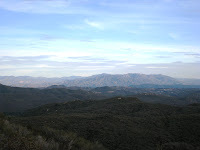 The full loop is composed of the Bear Ridge Trail and the Bear Canyon Trail. The hike is shorter if you do not complete the full Bear Canyon Loop and use the Bear Canyon Trail both ways. The best thing about this hike is that the trails are well marked and mileage is posted on the trail markers. The trail was in great shape and normally you will see other hikers out on the trail because the hike to Sitton Peak is popular hiking trail with Orange County Hikers. Sitton peak is just over 3,200 feet in elevation and the hike is about 10 miles round trip without doing the full loop. Remember to sign in at the San Mateo Canyon Wilderness register at the trailhead. 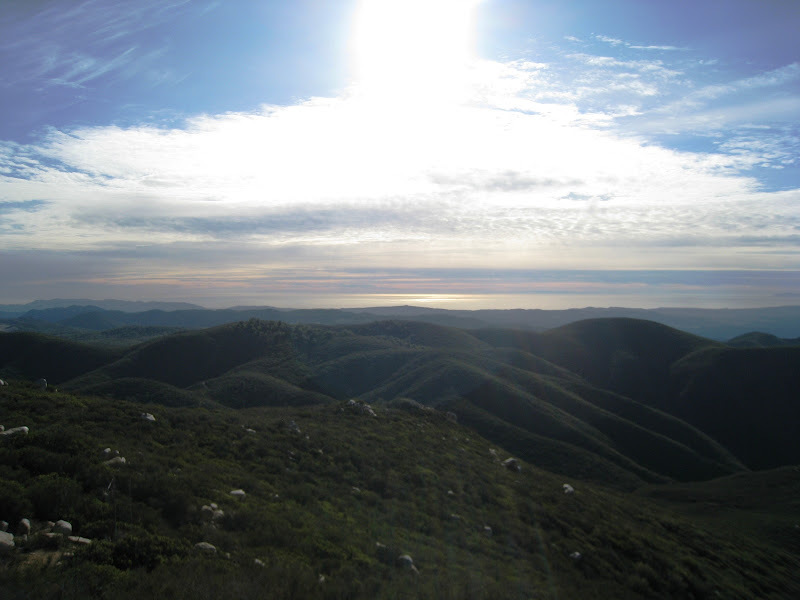 Further Thoughts: The hike to Sitton Peak is a great hike in the Cleveland National Forest and is a must do for any hiker in Orange County or Southern California for that matter. The trail has always been in good shape every time Ashley and I have hiked here. 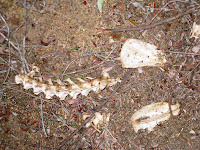 Ashley and I have always seen some type of wildlife while on the hike to Sitton Peak and there is always plenty of evidence along the trail of the wildlife that inhabits the San Mateo Canyon Wilderness. While on this hike to Sitton Peak in the Cleveland National Forest we saw a hawk, a bunch of birds, and the skeletal remains of some animal. Ashley and I believe the skeletal remains could have been from a small deer or some other type of similar sized animal. Unfortunately, Ashley and I were unable to determine what type of animal it was from the few bones that were left. The day before our hike to Sitton Peak, a low pressure system moved through Southern California, which meant the views on this hike were amazing. We could easily see 60 miles in all directions. We had great views of Catalina Island, the Palos Verdes Peninsula, the Santa Monica Mountains, Saddleback Mountain, San Gorgornio and San Jacinto. 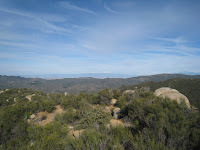 We could even see the Palomar Observatory in the Palomar District of the Cleveland National Forrest and enjoyed sweeping views of the Trabuco District of the Cleveland National Forest. 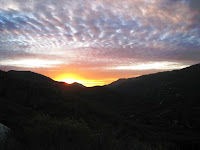 We ended this hike toward sunset and were amazed at the views in the canyons as the sun went down. Ashley and I both highly recommend this hike to anyone that is able to hike the approximate 10 miles. Make sure to bring a map of the area with you as well as plenty of water and sunscreen if you hike this trail on warm days. Additionally, the bugs can get pretty bad after a wet rainy season, so throw in the bug spray as well. The last portion of the hike to the top of the peak is a scramble up a steeper portion of a trail carved into the side of sitton peak. The incline is a little steep, but it is very manageable, just take your time going up. Bottom-line is this is a fun hike to one of the larger peaks in the Santa Ana Mountains. Rating: Elevation Gain: 2,200 ft. (Moderate), Distance: 10.3 Miles Roundtrip with full Bear Canyon loop (Moderate), 9.8 Miles Roundtrip without loop, only going through the valley (Moderate). Time to Complete Hike: 4.5 - 6 hours. Love your site! Hiked Sitton last weekend (10/20/10) after the rain let up, we were the only ones on the trail! Well except the mountain lion and cub that left very fresh tracks on the trail about 1/2 way thru the bear ridge trail! Talked to the ranger and the lady at the candy store, they said that one has been spotted in the area by hikers (who it followed) and the farmer who lives on the other side of the ridge. That is awesome about seeing the fresh mountain lion tracks. Thanks for the feedback! Just got back from a hike to Sitton Peak. We signed in at the summit and found your card in the canister. Love the blog. Keep up the good work. Just made the hike yesterday. Wish I had a map of the area instead of just hiking around haha... The last push to the top was a bit unexpected. I was thinking it would be a trail not a water run off route! Round trip was a bit over 4hrs. Took the 3.6 mile trail out and the 3.2 mile back. Only saw one couple out there and they were almost back down the hill. Great website, I had no idea how many trails were so close to my house! Your site is awesome. This is probably the most comprehensive so-cal hiking site I've found! I wanted to look up a hike for this coming weekend, Sat - Dec 17th. I realize it's been a late winter, but this sat seems sunny though a little chilly. I've been trying to choose between Chiquita falls and Sitton Peak for around 10 people. We're looking to be done with the hike around 4pm, is there either one you would recommend? Thanks! Just with the fact that the hike to sitton peak is shorter and the sun is setting early this time of year we would recommend sitton peak. Just make sure you start early enough to be done by your 4pm time frame. Have a great hike!